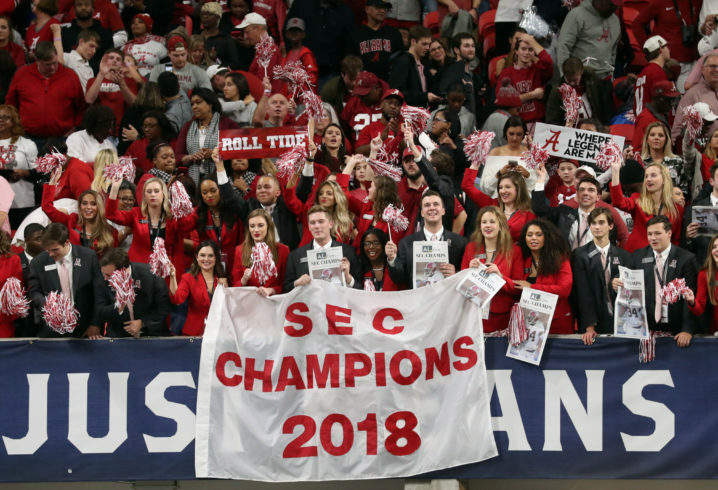 All of the bowl matchups are set, and it’s time for the SEC to prove their dominance across the country, or else face the wrath of sarcastic Danny Kanell tweets. Sorry Arkansas, Ole Miss, and Tennessee, you’re not included, but feel free to play along. This is a safe space for you, unlike this past season. Sure, Bama is scheduled to play Oklahoma in the Playoff semifinal game, but let’s be honest: The Tide’s only real opponents over the next 30 days are Tua’s knee and all those smaller schools trying to poach Saban’s assistants. If they can overcome both of those obstacles, Oklahoma’s defense will feel as easy as … Oklahoma’s defense. That sound you hear is thousands of Auburn fans searching Google to try to figure out what a Boilermaker is. Playing Purdue might no seem that exciting for most Auburn fans, but they are the team that forced Urban Meyer to retire, so when you look at it from that perspective, it’s a little better. And as always, the closer Gus Malzahn gets to being fired, the better he does, so look for the Tigers to win big here. After 6 long years, the Gators finally scratch and claw their way into a marquee bowl game, only to play the team that they’ve played almost every other year this decade. Yep, it’s Michigan. And while it would have been a lot of fun to be matched up against UCF and put the Knights in their place, at least the Gators will get to enjoy a trip to Atlanta without worrying about the whole getting crushed by Alabama thing. The Bulldogs just barely missed out on the Playoff, but playing Texas in the Sugar Bowl is a nice consolation prize. Georgia is a solid favorite, which should give Kirby plenty of latitude for 1-yard read option handoffs by Justin Fields and completely nonsensical trick plays. The good thing is it’s not the Playoff, no one will even notice or care. The Wildcats get to celebrate their best season in recent memory with a trip to the Citrus Bowl against Penn State. The Nittany Lions are a solid team that just so happened to lose to the two best teams on their schedule, while Kentucky just so happened to lose to the second-worst team in the entire conference. Who knows how this one will shake out. This bowl season, the Tigers aren’t just playing for themselves, or even just the SEC, but all of the Power 5 conferences, and really the entire societal structure of college football as we know it. If Coach O messes around and loses to UCF, you better prepare to watch Alabama or Clemson beat up on an undefeated G5 team in the Playoff from here on out. The Bulldogs are playing Iowa in the Outback Bowl, which seems to have a permanent reservation to play there every New Year’s. The good news is, Raymond James Stadium is allowing State fans to bring cowbells to the stadium, which might be the only thing to get Iowans to leave the state. Mizzou ended the year on fire, and the only thing standing between them and a 5-game winning streak is Oklahoma State. Which means the Tigers get to play the kind of Big 12 football they’ve been longing to all season. Can you imagine the kind of stats Drew Lock could have put up if he was playing against Big 12 defenses instead of the weekly grind of elite SEC defenses like Tennessee, South Carolina and Arkansas? South Carolina will play Virginia in the Belk Bowl, which I guess is better than not playing in a bowl at all. But despite what you might think at first glance, Virginia is a solid team that competed for and almost won in the Sun Belt, or excuse me, the ACC Coastal. The Aggies are playing N.C. State on New Year’s Eve, which will hopefully give them enough time to gain their legs after the LSU game. The Aggies match up well against the Wolfpack, but Jimbo Fisher sure doesn’t. There’s no telling what kind of past trauma will be brought up when he sees them run out on the field. Vanderbilt will play Baylor in the annual “Are we sure these teams are eligible?” Bowl. It might not be the sexiest matchup, but Tennessee fans will have no problem fitting it into their wide-open viewing schedule this bowl season. Crappy journalism is right! This article is legitimately dumb, and a poor attempt at humor. NEXT….. Okay, SDS, I give up. I’m a little worried about Kentucky. Las Vegas has them as underdogs. Go Blue! Why do we have to wait a month for bowl games? Every team in the SEC could have won another NCAA division one conference. Not only did Vanderbilt win enough, they looked professional doing it. Minimizing the league only makes your sportswriting small and immature sounding. Mizzou wrestling does. But you southern boys aren’t comfortable enough with your sexuality to have wrestling. Probably cause Vince McMann has convinced you his wrestling is real. PSU lost 3 games, that other loss was to a very mediocre Mich St team. I would like to see every SEC team win big in all the bowl games and shut the B1G, BigXII and PAC12 up! The ACC has Clemson which is as close to an SEC team you can get. Everyone else is well, hum-drum. AU win big? Houston, did you watch any Auburn games this year? If Malzahn ever discovers that his laminated play sheet is actually two-sided, we might stand a chance. Watching Auburn’s offense is like listening to Top 40 radio – its the same 5 songs over and over and over …. It’s the same as the weekly grind of writing the same glib article week after week after week after week ….